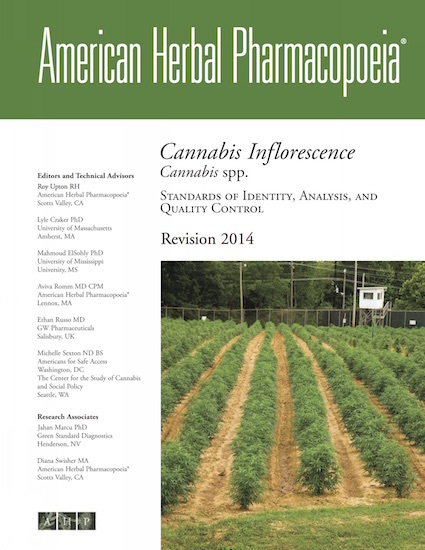 This AHP monograph is historic in that it is the first formal pharmacopoeial monograph on cannabis (Cannabis spp.) developed in the US in more than 70 years. The first monograph was introduced into the United States Pharmacopoeia in 1850 and was removed from the twelfth edition in 1942. Considering the widespread use of cannabis, it is important for there to be quality control guidance, whether used for medicinal or non-medicinal purposes. While identification of the species is typically not in question, quantitative testing of cannabinoids is in question. With a variety of analytical platforms being used, including TLC, HPLC, and GC, all with varying levels of accuracy, this an issue addressed in the monograph. Much of the monograph was developed in collaboration with numerous researchers at the University of Mississippi (UMiss) under the guidance of Dr. Mahmoud ElSohly, professor of pharmaceutics and one of this country’s foremost cannabis experts. UMiss is the only federally legal source of medical marijuana in the US, and they have been analyzing their own cultivated material, as well as products seized by the Drug Enforcement Administration (DEA), for more than 30 years. As such, they are among the most knowledgeable in the world on all things cannabis. The information provided in this monograph is of value to a wide range of those involved in the medical use of cannabis, including growers, caregivers, patients, practitioners, analytical labs, state regulators, and researchers. This pharmacopoeial monograph will be followed by a Therapeutic Compendium, which will present a comprehensive review of the world’s historical and scientific data on the medicinal use of the plant.